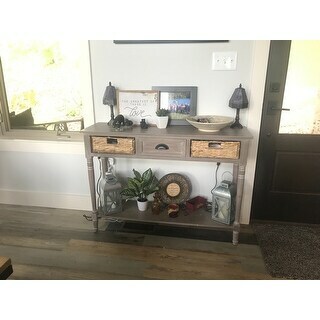 This table was perfect for our entryway. 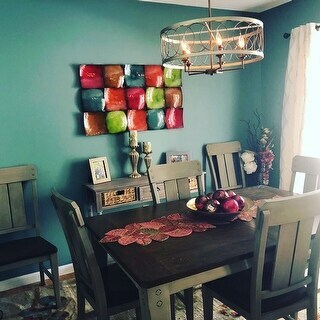 I have been doing so much searching and finally found this table. It was very easy to assemble. Even being pregnant, I was able to assemble it by myself! 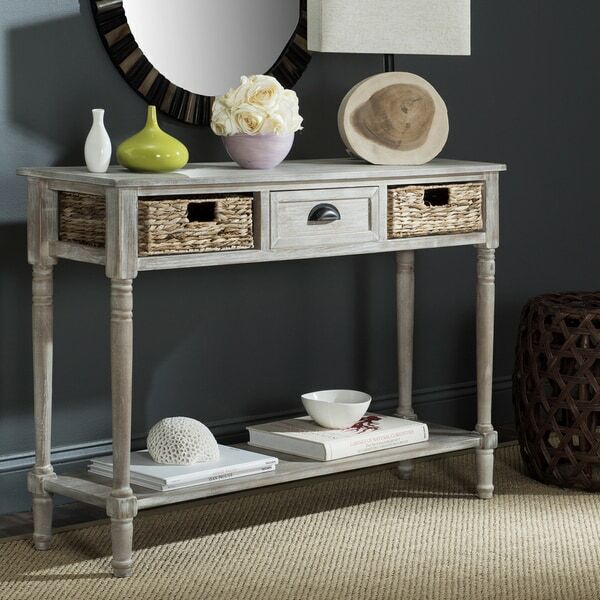 Safavieh Christa Distressed White Console Table - 44.5" x 13.4" x 31.5"
From coastal cottage to rustic lodge, this pretty distressed white washed console lends welcoming charm to an entry hall, and makes a wonderful focal wall in a living or family room. With rattan weave drawers and lower shelf, it is a canvas for accessorizing. Natural wood grain shows through this lightly white washed storage console. The console table was exactly as described (except that the color really should not be called “off-white” but I’m not complaining- since I searched for “white console tables” and that’s how I came by this one...) and putting it together was a breeze. I think the assembly took roughly the same amount of time for me to take the pieces out of the box, about 20 minutes in total. I bought this table to replace the white console table that I built myself a couple of years back. Initially I was looking for another white table to go with the white balustrades on the stairs. I am glad I took the chance to try something different, thanks to all the photos other reviewers posted, which convinced me this table might actually work. Its color is a nice neutral light brown that pretty much goes with any other neutral shades and also perfectly matches the beige linen benches we have. 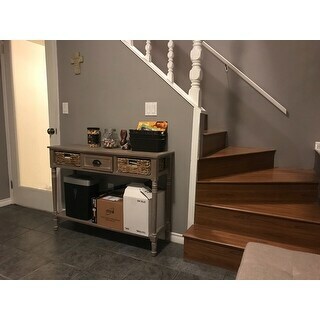 On top of the clean, updated look it gives to my hallway, it’s a practical/functional piece, with 3 drawers and one shelf for all the mails and parcels we’re yet to go through! 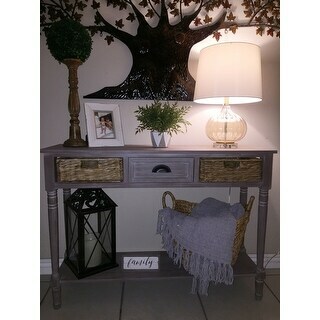 I am very pleased with this console table , I love shabby chic style and this fits in perfectly . The white washed paint and the natural color of the baskets work very well together. Absolutely love this console table- it’s just the right size for the space - easy to assemble and just enough space for some storage. Arrived quickly within a few days from ordering. Packed perfectly. Went together very quickly. I thought the color would be more white but "vintage white" seems to be more gray/white washed. But it works for me and my room. Decent quality for the cost and easy too assemble. Color is more grey with a subtle white wash. Perfect for a hall table. If using a lamp I would recommend something on the shorter side over your traditional thirty inch I taller buffet or console lamp. 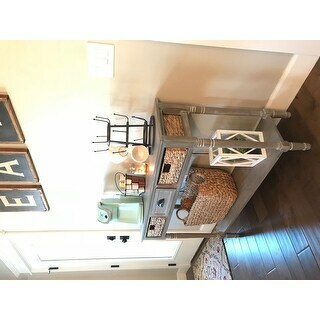 I love this console table! So easy to assemble and the finish is great. It’s a limed grey finish up close with lots of charm. This actually is a very attractive piece of furniture, however, it was advertised as "white washed"--and the picture makes it appear "white". All of the other furniture in my living room and dining room of our beach house are WHITE "white-washed", and it totally took me aback when I opened up this box and discovered a GRAY piece of furniture. Still, like I said, it's actually quite attractive, and I have decided to keep it despite the fact that it doesn't match the other pieces in the two rooms. 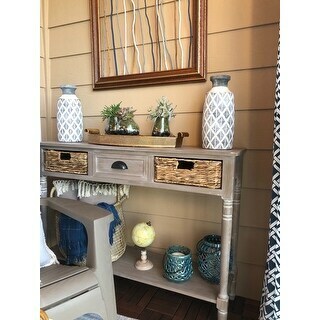 Console table has a nice classic look. The color was a bit surprising as I was expecting it to be more white in color. Distressed white over gray is a more appropriate color rating. I was still happy with the piece. If you are looking for a white table, this is may not be the best choice. 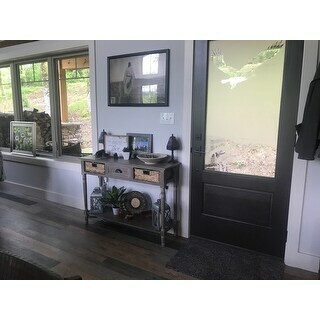 This works great in my entry way. The vintage white has a gray cast to it. Love having 2 shelves & a basket plus the drawer. Easy to assemble. Love this piece in my entry way! Easy to put together. I love this sofa table. It fits perfectly behind my loveseat. It was easy to assemble and the quality is very good. I would love to find more pieces with this finish. Assembled in five minutes. Looks great by our front entry. Love the little baskets and drawer for storage of everyday items. The baskets and drawer don't slide out th easiest, bi for the price point that's to be expected and is still very functional in my opinion. Great quality. Love the color/finish. 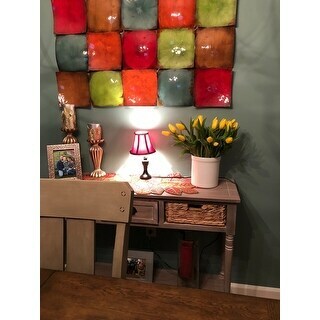 I ordered this table to use as a small sideboard in our small dining room. It is perfect for it! It is a great deal for the price. It is a little wobbly, but I am not complaining. 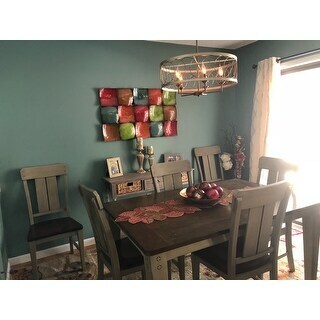 This was a great deal and I love the distressed finish. Nice solid piece of furniture. Not sure if the basket drawers will be very useful, but all in all, I am happy with the table for the price paid. Just like the picture. Sturdy, using as a coffee set up. I hung a sign above the table the states "this house runs on love and coffee." Wouldn't change a thing! Packaging was great as well. Beautiful color and design! The storage from the drawer and baskets are a huge plus. Sturdy design too! 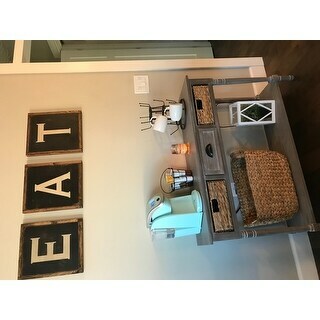 I purchased this to go in my dining room and it adds just the right touch to my farmhouse decor. It came just as it was described on the site! I will definitely be purchasing more to go with it! Timely arrival, careful and intact packaging. Easy to assemble, looks just like the photo. Fits perfectly. No flaws found, and quality made! Very happy with this purchase!!! 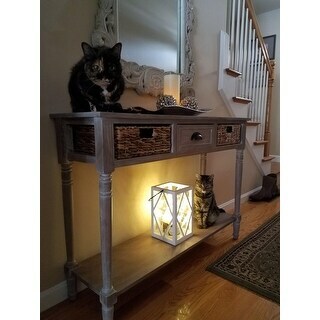 This is a beautiful piece of furniture-at a terrific price! Earlier this year I bought two end stands for the bedroom and this matches perfectly. "What are the dimensions of the drawers in this cabinet?" The dimensions of the drawers measure 12.2" W x 11.2" D x 4.5" H.
"What is the length of the table?" The length of the table is 44.5 inches. "Do you have any matching coffee table with this piece"
No,there is not a matching coffee table for this. "Is this sturdy and heavy? We are going to use it as a sofa table but weary about my 2 year old hanging on it? " While the weight capacity for the product is 60lbs, we do not advise that customers allow their children to hang off or play with the furniture. "does this come in the gray wash color"
This item is the closest to a grey color. Hello , Dimensions are: 31.5H x 44.5W x 13.4D. Have a great day! I chose this console table for the style & specific dimensions. It will go well with the colors in my home. Safavieh Winifred White Console - 44.5" x 13.4" x 31.5"